PHILADELPHIA, PA--(Marketwired - April 24, 2017) - Beginning in the fall semester of 2017, TruMark Financial® Credit Union will provide affordable financial products and services at a new student-operated credit union branch on La Salle University's campus. With a full service branch on site, students will have the benefit of learning how to manage their money more responsibly and have the opportunity to attend free financial literacy workshops. The branch is designed with a teller pod that gives the credit union a more welcoming atmosphere, removes the barriers of traditional high banking counters, and allows for a more personal service experience. "This new relationship aims to draw on the distinct strengths of each organization in working with youth: TruMark Financial's commitment to providing financial education for young adults and La Salle's mission and tradition of combining progressive ideas with practical needs of students," said Richard F. Stipa, chief executive officer, TruMark Financial. TruMark Financial is also providing a significant gift to La Salle for naming rights to the University's major athletic facility. The Tom Gola Arena at Hayman Hall will now be known as the Tom Gola Arena at the TruMark Financial Center. The credit union also will provide scholarship and financial literacy support at the university. 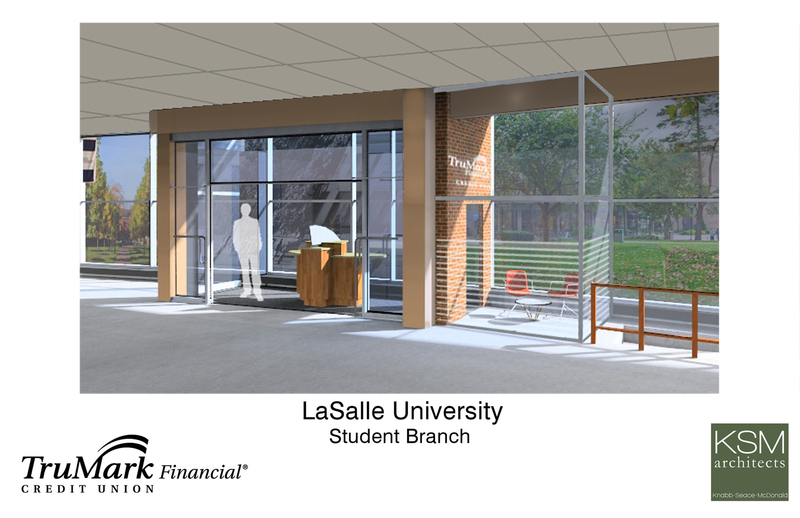 As April is National Financial Literacy month, both organizations are pleased to announce a comprehensive financial literacy program will be offered to engage and educate La Salle students in money management related subjects. The credit union will have a presence on campus, engage in professional mentoring to students, and participate in the university's experiential education program. By working together, both organizations hope to provide the students with the financial tools needed to make informed financial decisions so they can manage their money responsibly. As part of its ongoing financial literacy program, Building Financial Futures, credit union employees will work with school administrators and conduct personal finance presentations on topics such as saving, borrowing, investing, and budgeting on campus. About La Salle University La Salle University was established in 1863 through the legacy of St. John Baptist de La Salle and the Brothers of the Christian Schools teaching order, which St. La Salle founded in 1680. La Salle is an educational community shaped by traditional Catholic and Lasallian values, and has consistently been recognized for providing exceptional value to students, most recently by Money magazine (5th on the 2016 list of "50 Colleges That Add the Most Value"), Forbes ("America's Best Value College" list), and The Economist ("Top 100 Schools in the U.S. for Value"). Globally, the Lasallian educational network includes nearly 1,000 schools and centers of education, including 62 colleges and universities, serving 960,000 students in 77 countries. About TruMark Financial TruMark Financial is one of the strongest, most progressive credit unions in the nation, offering a full range of banking, investing, and insurance services to more than 115,000 members in Southeastern Pa. Founded in 1939, TruMark Financial is headquartered in Fort Washington, Pa., and has approximately $1.9 billion in assets through its 23 branches, Call Center, and a suite of innovative online and mobile banking services. To learn more about TruMark Financial, visit www.trumarkonline.org or call 1-877-TRUMARK. Connect with TruMark Financial at facebook.com/trumarkonline and twitter.com/trumarkonline.